Sendak, Maurice. Fine in Fine in Archival Plastic Cover jacket. 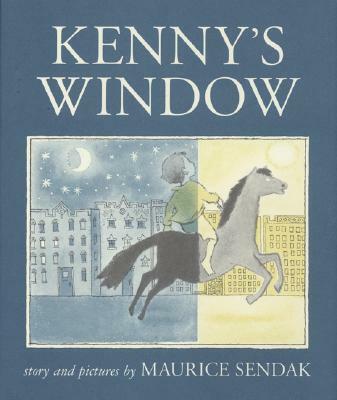 Signed by Sendak copies of "Kenny's Window" are very scarce! This is a lovely reissued edition signed for Parrish Books on the half-title page by Maurice Sendak at his "barn" on Feb. 1, 2004. Originally published in 1956, this is the story of a young boy and his wonderful imagination. The illustrations are wonderful. 59 pp., unpaginated. In fine beige cloth with a fine colorful dustjacket in protective plastic cover. Very good. Minor shelf and handling wear, overall a clean solid copy with minimal signs of use. Clean unmarked pages with good binding. Dust jacket in mylar. Secure packaging for safe delivery. Very good. Dust jacket in good condition. Minor shelf and handling wear, overall a clean solid copy with minimal signs of use. 1984 on copyright page. A few small closed edge tears on jacket. Secure packaging for safe delivery.